Shelter from the Storm. Series in which Paul Murton takes a tour of Scotland’s lochs. In this edition, he travels from Loch Gairloch to Loch Maree and meets the king and queen of Islonia, matches a medieval feat of archery, dives on a wartime wreck in Loch Ewe, and finds himself short-changed on an island in Loch Maree. Documentary series going behind the scenes at one of the UK’s busiest transport hubs. 20,000 football fans take to the western network for the Champions League Final in Cardiff. Extra trains have been laid on, but getting everyone home after the match is complicated by a major terrorist incident at London Bridge. The Adventure Show is at the River Tay for the inaugaral Adventure Show Super Cup, with Olympic gold medallist Tim Baillie providing an expert’s view on the action. Plus Deziree Wilson discovers Scotland’s most select running club, and endurance athlete Katie Ford on whether she can set a new cycling record whilst living with epilepsy. And Cameron McNeish is back with a wild walk in Highland Perthshire. Documentary following the men and women of the Royal National Lifeboat Institution (RNLI). In south west Wales, the Tenby crew race to a kayaker with suspected back and neck injuries after being caught out by a freak wave. Neighbouring Cornish crews must join forces in an epic 11-hour battle to stop a 3,600-tonne coaster breaking up on the rocks. And the Dart and Salcombe crews are astonished to be paged to the biggest shout of their lives. Penny Talelli has a passion for cutting-edge contemporary architecture, while husband Mark Edwards loves period buildings. Somehow, these two neurologists want to build a family home that satisfies both their tastes. But will it be the best of both worlds or just an appalling mishmash? Taking the plunge, they buy a derelict Victorian gatehouse on a very steep hill in north London, that currently sits abandoned and unloved. The plan is to restore it, paint it white, and then add a giant black zinc-clad box at the back, marrying their love of old and new. But they run into problems. The gatehouse needs knocking down. Excavating the sloping site takes longer than expected. Increasingly struggling to balance their busy working lives with project managing the build, the future of Penny and Mark’s unconventional home hangs in the balance. It’s the last stage of the contest. Which team will be crowned Lego Masters 2017? First, the remaining teams face their toughest quick-fire build of the competition and their toughest critics – children. The teams then have just three hours to bring the children’s inventive stories to life as brick displays – including a robot with an ostrich head, an alien from the planet Zorg, and a monster who devours a chocolate lake. Next, for the Grand Final, the remaining two teams have two weeks and half a million bricks to make their masterpiece. One team makes a human sculpture while the other createa a mythical world. Both builds are revealed to the public at London’s Design Museum; where they are judged by The LEGO Group’s Matthew Ashton and celebrity guest judge comedian Dara Ó Briain. Series in which Paul Murton takes a tour of Scotland’s lochs. In this edition, he explores the wilds of Loch Etive, from the spectacular tidal race of the Falls of Lora, where kayakers revel in the overfalls and ride a three-metre standing wave, to high-altitude camping on a hill opposite Buchaille Etive More, watching the sunset. Drama showing the impact Princess Diana’s tragic death has on four ordinary people. Jack is the only child of an adored mother who dies the same night as Princess Diana. He struggles to come to terms with her death while computing the loss of an icon who meant so much to both of them. Yasmin is unhappily married to Hassan, an unsuccessful businessman who can’t admit his failure. Inspired by the public outpouring of emotion at Diana’s death, Yasmin goes on a journey of self-discovery. Michael is a junior reporter on his honeymoon in Paris with his new wife Sophie when news of Diana’s death breaks. Spending more and more time on the story at the expense of his honeymoon, Michael struggles to balance his career with his fledgling marriage. Mary is a Glaswegian florist, struggling for money. Mary hatches a plan to drive to London and sell flowers before Saturday’s funeral. 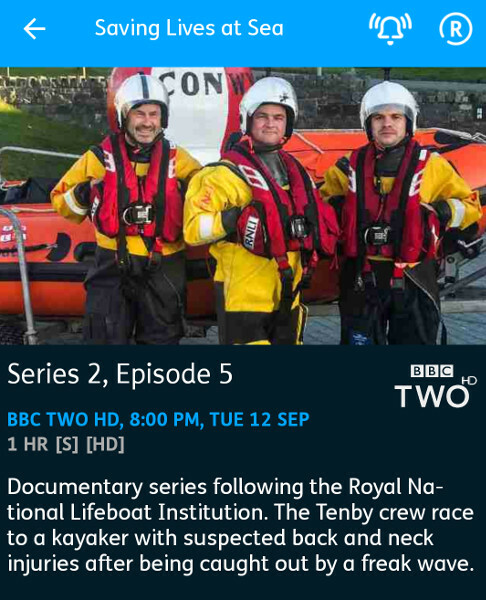 Documentary following the men and women of the Royal National Lifeboat Institution (RNLI). In Bangor, Northern Ireland, crew are tasked to find two teenage paddleboarders blown offshore towards nearby shipping lanes. When the Tenby crew learn a dog has fallen over steep cliffs, there is a race to reach him before concerned members of the public attempt to rescue him themselves. And on the north Norfolk coast, the harrowing hovercraft rescue of three young sisters still brings back painful memories for the Hunstanton crew. Few people would be brave or foolish enough to buy a building plot without visiting it first. 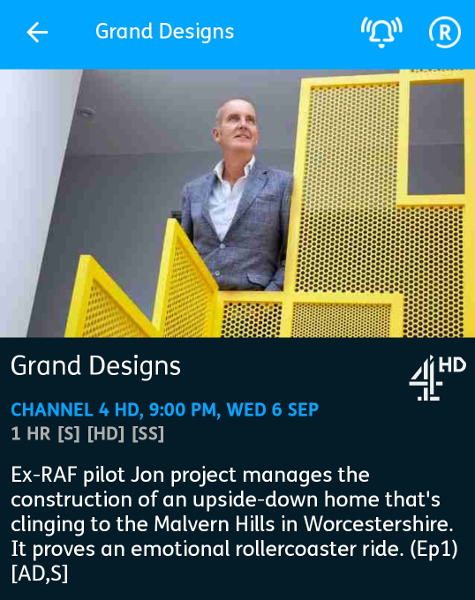 But that’s exactly what ex-RAF pilot Jon and GP Gill Flewers did. Returning to the UK after a four year stint in New Zealand, this intrepid pair want to build a Kiwi-style hill house on the slopes of the Malvern hills in Worcestershire. Their ambitious three storey upside-down home will be clad in wood and stone, clinging to the hill and designed to take advantage of and enhance the surrounding scenery. But there are problems. The site is so steep that builders don’t want the job. So, despite a complete lack of experience, Jon quits his job to run the project himself. It proves an emotional rollercoaster ride. The search for the UK and Ireland’s most talented Lego builders continues. Nature is the theme this time as the remaining five teams take their construction skills into the great outdoors. The challenge is to create and install a spectacular brick display for a nature walk that will be transported to a woodland in Essex. From plants, animals and insects to mythical creatures, the teams can create whatever they want, but it must be full of character, wow the judges, and fit seamlessly into the environment. So how do you integrate a Madagascan crocodile into the Essex countryside? And there’s a frantic hunt on for a missing chrysalis. There’s also a quick-fire round to make as many miniature insects, birds and wild animals in 45 minutes, using no more than 15 bricks. Joining The Lego Group’s Matthew Ashton as guest judges is one of the world’s leading brick animal artists Sean Kenney, and comedian Bill Bailey. Conditions at the refugee camp cause a member of the ED team to take drastic action. In Holby, recent events are taking their toll on Jez. In August 1997, the tragic death of Diana, Princess of Wales, stunned her family and catapulted the British public into one of the most extraordinary weeks in modern history. This programme hears from some of those most affected and those in the public eye at the time, such as Diana’s sons Prince William and Prince Harry, her siblings Earl Spencer and Lady Sarah McCorquodale, former prime minister Tony Blair and members of the royal household. What was it about Diana that resulted in such an outpouring of grief? And what does that week reveal about Britain’s relationship with the monarchy, then and now? Documentary following the men and women of the Royal National Lifeboat Institution (RNLI). In Ireland, the Castletownbere crew race to rescue a lone yachtsman who has lost his mast and is drifting powerless in ten-metre waves, 45 miles out to sea. In Minehead, a woman on a clifftop walk has gone missing, and after 17 hours, the crew are called to search the shoreline. And for an injured horse rider on a remote beach, the Porthcawl crew are the only way to emergency medical help. In May 2017, a suicide bomber attacked a pop concert by Ariana Grande in Manchester, killing 22 people and seriously injuring 59. Many of the victims were children and their parents. This is the story of the events of that night and a city’s response over the past 100 days, featuring powerful and emotional testimony from those who were there and those who are rebuilding their lives. Narrated by Christopher Eccleston. Hong Kong. Dan Snow, Anita Rani and Ade Adepitan reveal the hidden systems and armies of people running some of the greatest cities on earth. This time, they are in Hong Kong, where space is at a premium and real estate is the most expensive in the world. Ade heads into the high rises to find people living in tiny spaces no larger than a cupboard. This former British colony, handed back to the Chinese in 1997, is a city driven by trade and commerce. Dan discovers how it is adapting to life in China’s embrace, while Anita learns about the city’s many traditions – from bamboo scaffolding to banishing bad spirits on the daily commute. Ade heads to the races at Happy Valley, and Dan discovers the history of the origins of the Hong Kong and Shanghai Banking Corporation – HSBC. Hong Kong is crowded, chaotic and facing an uncertain future. How does this city of contrasts manage the delicate daily balancing act that keeps it on track? The search for UK and Ireland’s most talented Lego builders continues. This week the teams must step up a gear and make their models move. They have to build a funfair with at least one spectacular supersized mechanical ride, complete with moving parts and characterful stories in miniature form. While an inventive spinning laser ride draws the crowds to one fairground, a sandwich-stealing shark is a pest at another. The judges also throw them a curve ball with their unplanned challenge, where the teams find themselves having to quickly build a vehicle with no time to prepare. But that’s not the only surprise in store, as halfway through the challenge the judges give each team a new mode of transport and announce that they must create a hybrid of the two. One team must go home, so who will rise to the challenge and who has laid their very last brick in the Build Room? As some of the team head to France to help aid efforts at a refugee camp, their experiences leave lasting impressions. At the ED, Connie’s world is rocked by sudden news. Documentary series following new recruits as they train to become pilots for easyJet. In this episode, newly qualified 20-year-old Ryan Clyde has his first landing in Paris, in the dark and with passengers on board. One passenger has never flown before and is extremely nervous. Cadet Sophie is now back in the UK, learning how to deal with G-force, and the trainee captains take a jaunt to France to show off their experience to seven more trainees. In this final episode of the series, as the busiest event of the year fast approaches, there’s a staffing crisis at Tan Hill Inn, Britain’s highest pub. At Muncaster Castle in the Lakes, the library ceiling needs urgent repair work, including intricate gold-leaf design. Lake Warden Martin Dodgson patrols Windermere, England’s largest natural lake. And as the start of the climbing season approaches, Zac Poulton and fellow adventurer Mick Allen complete safety checks on the Shepherd’s Crag rock face in Barrowdale. Documentary following the men and women of the Royal National Lifeboat Institution (RNLI). Off the coast of Bridlington, a kayaker has been missing for an hour and only the crews’ tidal knowledge can track him down. A crew member on his first shout races to a dinghy capsize to find a man losing consciousness in the water. And when a fishing trawler sinks off the coast of the Shetland Islands, the fishermen and RNLI crew aboard must swim for their lives. The hunt is on for the UK and Ireland’s best Lego builders, as some of the country’s most skilled brick fanatics do battle to be crowned Lego Masters. In the first episode, 48 pairs are whittled down to just eight final teams through a series of challenges. Next, the eight teams must create a spectacular brick banquet, including an impressive chair that not only looks the part, but also strong enough for presenter Melvin Odoom. The teams must also make at least one supersized masterpiece for the banquet table. The results include a crispy aromatic duck and prawn toast, a hog roast, and a gravity-defying cuppa. Judging the models is a man who knows a thing or two about bricks, The LEGO Group’s Matthew Ashton, Vice President of Design. Joining Matthew this time is structural engineer Roma Agrawal, who will be looking at how the seats sit up under scrutiny. Two teams must be eliminated. Who will tower above their opponents, and who will come tumbling down under the pressure?